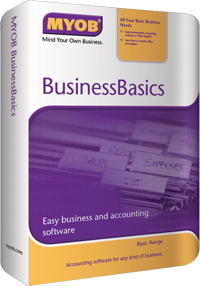 MYOB BusinessBasics is an entry level bookkeeping system, ideal for start-ups, sole traders and service business. It has modules for Sales & Invoicing, and CashBook, and General Ledger. It handles bookkeeping and simple accounting, and generates the complete financial statement (Profit & Loss statement, Balance Sheet, Trial Balance). You can print the 'General Ledger, Customer ledger and CashBook at any time you wish. It provides a real time report of the business. Start your invoicing process by using the 'Enter sales' module in MYOB BusinessBasics, then print the invoice for your customer. (The invoice format is easily customisable by you with a few clicks of the mouse). Use MYOB BusinessBasics to track who owes you money, manage your GST receivables and payables, and get an up-to-date balance of your cash and bank balances. You don't have to be an accountant to use MYOB software. It is designed for people (especially business owners) with no previous accounting experience. By using MYOB BusinessBasics software as part of your business process, you will become, what we like to call Accountants By Chance ("ABC" ). You will slowly learn how to read the numbers generated by the system. Heh! its your own business, and you should monitor its health and its progress.